Thank you for your comments. It is evident that you have an abiding interest in the matter of the great terminal ice age floods. You raise some valuable points in regards to the Missoula Floods. I will address some of them here but due to time constraints will have to save some of my remarks for another post. My reasoning on the question of ultimate causes grows out of theoretical considerations regarding the efficacy of glacial ice to impound water to the depths and pressures required by the standard model, if we can call it that, as well as empirical evidence derived from extensive field observations. There are a number of considerations that must be factored in to make the orthodox scenario work. On the one hand there must be a massive amount of perfectly stable glacier ice blocking the mouth of the Clark Fork Valley just below Lake Pend Oreille. This ice must form a perfect seal across a valley with a wetted perimeter in excess of seven miles. The water backing up behind the dam, as you correctly observe, rose to an elevation of 4,260 feet, making it some 2100 feet deep at the heel of the ice dam. This induces a basal pressure in excess of 960 psi. One point that needs to be emphasized is that given the massive amount of water immediately contiguous to the glacial dam (some 525 cubic miles) the regional climate must be temperate enough to sustain this huge volume. But here we are confronted with the paradox of the standard model. Only a cold-based polar type glacier would have the stability to retain water to such extreme depths, but that implies a climate that is not conducive to the accumulation of such a massive glacial lake. The water forming Lake Missoula could only have come from two sources: either direct meltwater or rainfall, or some combination thereof. Yet no matter how we contrive to amass such a volume it requires a relatively warm, temperate climate and modern glacial studies have demonstrated that temperate glaciers are notoriously unstable. If we employ the Uniformitarian principle and turn to modern examples of jokulhlaups or glacial outburst floods we find that they are a full three orders of magnitude smaller than the largest Missoula floods in terms of peak discharge. Most modern examples of glacially-dammed lakes fail when the lake depth reaches from one hundred to roughly three to four hundred feet against the glacial dam, consistent with Glen’s Law. Temperate glaciers typically ride upon a layer of basal meltwater, are riven with fractures and moulins, and are permeated with an interstitial cavity network throughout. Any civil engineer will tell you that in order to retain water to any significant depth, both the seal between the dam itself and the substrate must be completely impermeable, and the material forming the dam must be totally impervious, or eventual failure will ensue. Reference the Teton dam failure of 1976 or the St. Francis dam failure for two relevant 20th century examples. The St. Francis dam failure of 1928 resulted from forced percolation through the bedrock with a hydraulic head of only 182 feet. The ultimate cause of the failure was blamed on a defective foundation. Modern engineered concrete dams employ bedrock grouting to eliminate any cavities that might allow percolation as well as designing intermediate abutments to maximize dam stability. It was this knowledge that prompted C. Warren Hunt, a Canadian engineering geologist, to write in 1977 that it was “frivolous” to think that a glacier could impound water to anywhere near the depth of Lake Missoula. I think even a modest application of the knowledge of glacier dynamics would refute the “standard” model. The approximate distance from the ice dam/lake water interface in the region of the Cabinet Gorge dam in the Clark Fork Valley, to the discharge point at the toe of the Purcell Trench lobe of the glacier was about 35 to 40 miles. For comparison, let’s turn to modern examples of jokulhlaups, such as the largest known of modern times, the drainage of the Grimsvöten subglacial reservoir beneath the Vatnajökull glacier in Iceland in 1996. The total volume of this subglacial reservoir was less than three-fourths of a cubic mile. The volume of one supposed outburst of Lake Missoula, then, would have been 700 times greater. Yet this .72 cubic miles of water of subglacial Lake Grimsvöten was able to force its way through and under the overlying glacier to the discharge point on the alluvial plain – a distance of about 30 miles – in about three weeks, demonstrating the porosity of glacial ice. I could site literally dozens of modern examples but I think you get the point. There is a major disparity between what we have actually witnessed in terms of glacial outburst floods and the scenario invoked to explain the Missoula Floods. Again, I will state what I believe to be the two fatal flaws in the standard model: first, the discrepancy between the existence of a large, extremely stable ice mass, requiring a polar environment, contiguous with a large volume of, presumably, meltwater (?) or rainwater (?) or both, either way implying a relatively warm climate. I think it is fair to say you could have one, but not the other; and, second, the efficacy of glacial ice to impound water to such extreme pressures as would be the case with a 2,100 foot hydraulic head. Given time constraints I can now only address some of the theoretical issues. The field evidence inconsistent with the standard model is copious and growing by the year. I will discuss some of this field evidence in other posts. 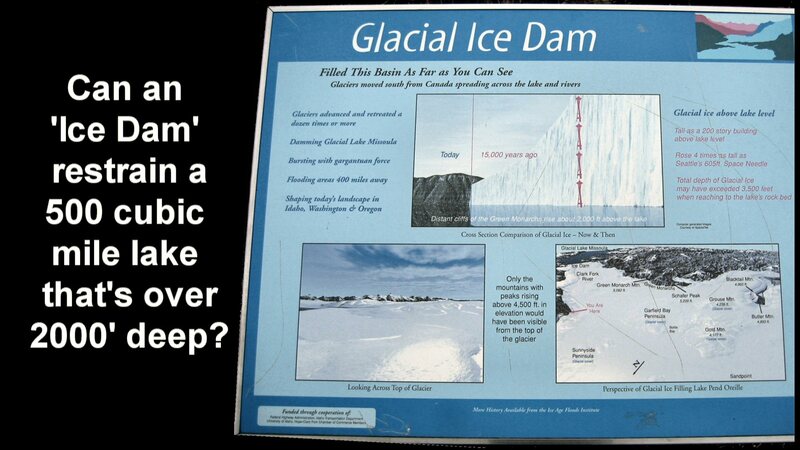 My final remark here concerns the proficiency of cosmic impact to melt large volumes of glacial ice suddenly. A moderate size stony asteroid, of say about 3000 feet in diameter, with a velocity at impact of about 10 miles per second, will release kinetic energy in the range of 46,000 megatons (1.9 x 1024 ergs). 46,000 megatons is about four times the entire nuclear arsenal of the superpowers at the height of the cold war. The largest hydrogen bomb in the U.S. arsenal was about 15 megatons, enough to utterly incinerate any major metropolitan area on Earth and about equivalent to the energy released by the Tunguska explosion of 1908. 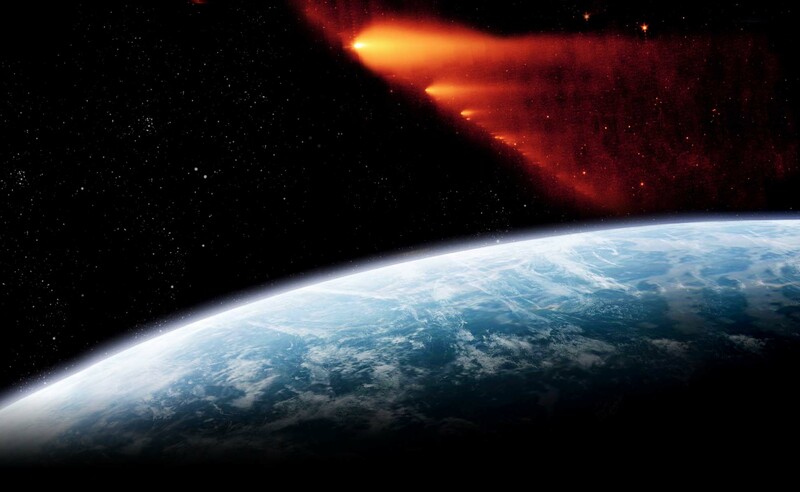 A 3000 foot diameter asteroid on impact would unleash the equivalent of 3000 or more of these bombs all at once, more than enough thermal energy to melt an enormous amount of ice, not even considering positive feedback processes such as the temporary greenhouse effect induced by the excessive amount of water vapor that would be lofted into the atmosphere, or the further melting resulting from rainout back onto adjacent ice masses. Future posts on this website will address the abundant field evidence that supports the idea that it was a sudden, catastrophic melting of the Cordilleran Ice mass over British Columbia that was the ultimate cause of the Missoula Floods and that Lake Missoula itself was a short-lived, secondary consequence of this melting.